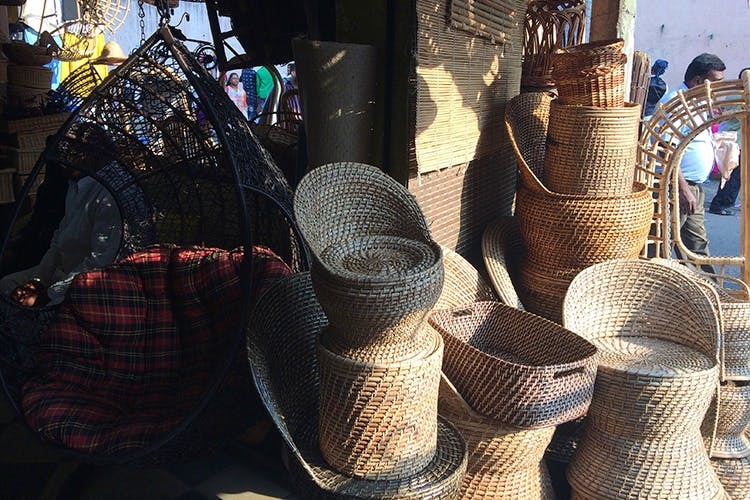 Cane Centre, near Commercial Street, is popular with shoppers for its range of home decor offerings, all made in cane. Laundry bins, picnic baskets, trays, swing sets, blinds and outdoor furniture can all be bought here starting at just INR 100. Located on the busy MK Street, close to Russell Market, Cane Centre specialises in cane, home furniture and decor products. We found that their range was better priced than many of the fancy showrooms elsewhere in the city. So, if you are looking to doing up your home on a budget, Cane Centre is the place to head to. For those of you looking to concentrate entirely on home decor knick knacks, and odds and ends – you won’t be disappointed. They have lovely fruit baskets and trays that begin at around INR 250. If you prefer even better priced ones, go for those that are woven out of bamboo, these start at just INR 100. You can also browse the shelves for laundry baskets (INR 1,200 upwards) and rustic picnic baskets (INR 650 upwards). There’s plenty of heavy duty stuff too. We spotted trendy Ottoman-sized stools and also cushioned ones (prices start at INR 2,500). They also have outdoor furniture sets — chairs and sofas – that begin at round 15,000. Want to get a swing instead? You can snap up one for INR 8,500 (prices go up to INR 9,500). These are light-weight and perfect, if you don’t want to invest in heavy furniture or think you’ll be moving a lot. Show your windows some blind love with bamboo blinds from here. All you need to do is bring them the measurements and choose the type you want from their samples. These guys will also fit in a fabric piping of your choice. Prices for the blinds usually begin at around INR 45 per square feet. While the prices are pretty pocket friendly, you can still ask for a discount. Use those bargaining skills, we say!